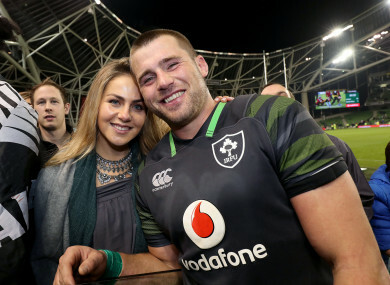 Stander and his wife, Jean-Marie, after the game. IT WAS ONLY a matter of time before CJ Stander produced a performance of such aggression, robustness and energy again, but it must have been especially sweet for him that it came against the country of his birth. Sent off against the Springboks in Cape Town 17 months ago, last night the Munster number eight returned to his destructive best to put to bed any question marks hanging over his form. Granted Stander has looked to add new skills to his game since the Lions tour, but it was a welcome sight to see him return to what he does best at the Aviva Stadium — carry hard, cause chaos at the breakdown and make 16 big hits. The highlight of Stander’s evening was in the 31st minute, when he denied the visitors their best scoring opportunity with a perfect turnover after stealing it off Siya Kolisi in the trenches. “He was impressive on both sides of the ball,” Schmidt said afterwards. “CJ got onto the breakdown ball pretty well a couple of times. He couldn’t always stay on it but he got some good ones. And he carried with that intent. Stander — only second to Bundee Aki on the tackle charts — was part of an impressive defensive effort, with the hosts’ aggressive line speed squeezing the ‘Boks and giving them no time with ball in hand. As much as the visitors were rudderless in possession, horribly inaccurate and lacked any sort of front foot ball, credit must go to Andy Farrell and the Irish defensive line for their discipline and precision throughout the 80 minutes. “Faz has pushed for us to be attacking when the opposition have the ball,” Rory Best explained afterwards. “We know how dangerous they are when you give them time and space. By and large we were smart in there in defence. Best added that the double-team tackle from Bundee Aki and Johnny Sexton in the first minute set the tone and provided an entry point into the contest for Ireland. Email “Stander rediscovers his best form to produce especially sweet performance”. Feedback on “Stander rediscovers his best form to produce especially sweet performance”.